I was asked the following question on Quora and thought it interesting. If all the delivery vehicles on the roads became electric vehicles, would this not have a huge impact on the emissions problems? My Answer: That depends on what you’re meaning by “delivery vehicles.” The world’s number one polluter right now, in transportation, is actually oceanic shipping. The greatest impact would actually be the easiest to bring about: change commercial seafaring to cleaner options. That’s far less than road-going transportation, in terms of numbers to be changed, and far easier given that most of the world’s largest users of that shipping at least give lip service to the idea of climate change. But the chances of that happening are about the same as getting China—by far the world’s largest dumper of pollutants into the oceans—to stop pouring garbage into the sea. You’re probably referring to commercial land-based transport, which is what is most visible to the average person on the street. Local delivery vehicles, such as that which brings your pizza or delivers your Amazon box, would definitely help at the local level were it to become electric. That’s already happening. The two fastest-growing transportation sectors, in terms of electrification, are transit buses and local delivery trucks. Currently, cities around the world, including here in the U.S., are adopting electric and electrified buses by the thousands. One of the world’s largest electric bus makers, BYD, is operating in at least four countries I can name off the top of my head. Meanwhile, delivery companies like UPS, FedEx, DHL, etc. are also heavily testing and adopting cleaner transportation options in their fleets. Especially where the government-funded payoffs are the heaviest, if you get the drift. Other local transport, such as moving shipping containers from the aforementioned emissions- and trash-dumping ships to local warehouses, is also seeing a lot of electrification and emissions cleaning. 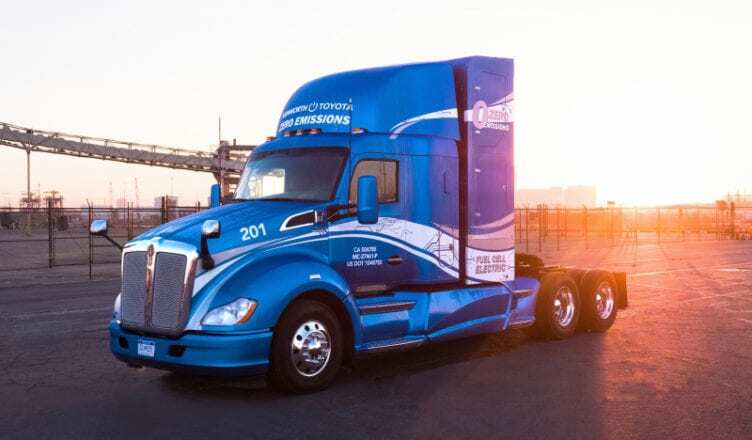 Natural gas, battery electric, and hydrogen fuel-cell rigs are hauling goods from seaports in California and Texas right now. More are coming. Specialized transport for operations such as mining and the like have been using diesel-electric options for decades already. Trains run that way, so do big mining trucks and many pieces of stationary machinery. Now that’s starting to happen with more mobile machinery such as the diggers and shovels you see building the roads we all drive on. It makes sense economically, so it’s happening. Over-the-road transport is nowhere near having a replacement for diesel. Tesla and Nikola like to talk a big game, sure, but right now, there is no realistic option. Natural gas is far less efficient at moving heavy loads as is diesel. Battery-electric seems like a great idea until you realize that none of the players with their big rig vapor machines for hauling goods have given any indication of what the actual amount of goods the trucks can haul would be. We can make guesses, and I’ve done so in some articles in the past, but in a best-case scenario, we’re talking about shaving at least a ton off of the freight capacity of the truck in order to allow for enough batteries to make the range worthwhile. That’s literally a ton of freight that will not be hauled and thus it’s less efficient, economically. And that’s a best-case scenario. So we can pretend it’s some kind of redneck social b.s. reason for not believing in climate change and all the rest, but the reality is that the economics are not there for it to happen. Or the trucking companies would have already done it. The economics for other things, such as changes to the trucks themselves, that have happened like exhaust scrubbing, aerodynamics, and more have been happening fast. Because there’s real-world incentive for doing so and it just makes sense. When I drove over the road, sulfur-free diesel was a relatively new thing. But companies embraced it because it was literally better for them. So were newer rig designs with sharper noses and more aerodynamic bodywork. As were built-in generators to avoid idling and more. Today, I see far more rigs with not only those improvements, but also skirts and tails and other aero-improvements for more efficient driving. The reduction of speeds to 65 mph or less in rigs has been a thing for at least three decades now, which has improved fuel economy immensely—not to mention safety. For an industry that thinks in terms of decades, not months or years, the trucking industry has really grabbed on and jumped forward with improvements when those improvements are guarantees for more efficient operations. Because efficiency means more money and more money is always a good incentive to make things happen. There is a caveat to that, however: if the money is fickle government funding, it doesn’t usually work in as big a way as one might hope. Because everyone knows that what is given today can be taken away tomorrow. But if the money is bottom line savings that can be definitively shown to be short- or long-term and real, any business (doesn’t matter what it is) will jump on it. Even in the (supposedly) redneck world of trucking.